Principles inform and guide decisions and choices. Principles-driven people are motivated by deeply help values expressed through principles that translate values into behaviors. Principles-focused evaluation makes principles the focus of evaluation (the evaluand). Principles-focused evaluation examines (1) whether principles are clear, meaningful, and actionable, and if so, (2) whether they are actually being followed and, if so, (3) whether they are leading to desired results. Principles are derived from experience, expertise, values, and research. 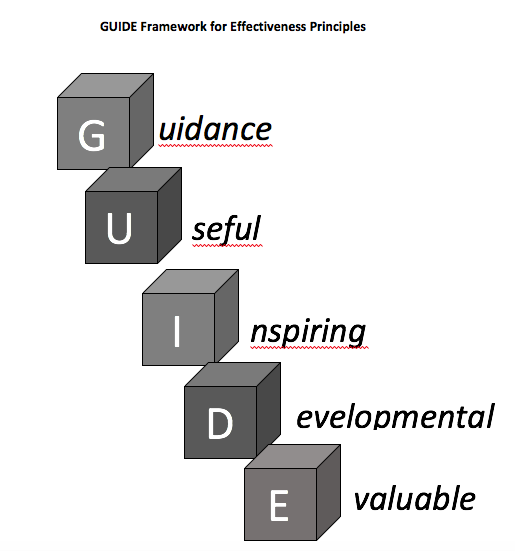 The GUIDE framework is a set of criteria for clarifying effectiveness principles, that is, a tool to help a principles-based program ensure readiness for principles-focused evaluation. GUIDE is an acronym and mnemonic specifying the criteria for a high quality principle statement. A high quality principle (1) provides guidance, (2) is useful, (3) inspires, (4) supports ongoing development and adaptation, and (5) is evaluable. Essentially, GUIDE criteria provide an evaluability assessment framework applied to principles. Lessons Learned: Evaluating principles is different from evaluating projects and programs. Hot Tip: Engaging in principles-focused evaluation often involves helping clarify principles to articulate them in a way that can be evaluated. Value statement: We believe in social justice. Principle: Design interventions to support social justice. Lesson Learned: Effectiveness principles are especially useful for navigating the turbulence and uncertainties of complex dynamic systems. The American Evaluation Association is celebrating Principles-Focused Evaluation (PFE) week. All posts this week are contributed by practitioners of a PFE approach. Do you have questions, concerns, kudos, or content to extend this aea365 contribution? Please add them in the comments section for this post on the aea365 webpage so that we may enrich our community of practice. Would you like to submit an aea365 Tip? Please send a note of interest to aea365@eval.org . aea365 is sponsored by the American Evaluation Association and provides a Tip-a-Day by and for evaluators.